The 26-year-old will be sentenced next month after pleading guilty on Monday at Airdrie Sheriff Court. Buddies manager Danny Lennon said: "It's up to us to help guide him back on to the right track. "The club will take action against him, but it will be dealt with internally. Paul is no problem for us." 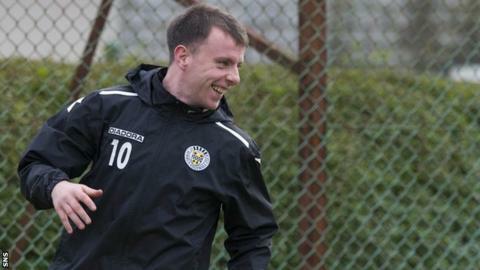 McGowan had looked likely to leave St Mirren Park in the summer after expressing a desire to play in English football. But he after failing to find a suitable club. This week, he admitted kicking Police Constable Edward Gilmartin on the body and repeatedly kicking sergeant Tony Fitzpatrick on the body during the incident in his home town of Airdrie and then later at Coatbridge police office on 11 August. Sheriff Petra Collins deferred sentence on McGowan until 8 January for reports and his bail was continued. "You're not always just a coach to these guys, sometimes you are a father too," said Lennon. "But it's about how you come through the tough times and Paul truly regrets every mistake he has made. "It's getting dealt with and he goes back up in January. What will happen will happen. "But, until then, we will do everything we can to help." Lennon defended the former Celtic, Morton and Hamilton Academical midfielder's character. "Everyone makes mistakes throughout life and it's about cashing in on the lessons they teach you," said the Buddies manager. "He's not a bad lad. In fact, he's a lovable wee character. "He just loves playing football. In fact, he would kick a ball about 24 hours a day. "Maybe that's how we calm him down - just put a ball at his feet and let him run about all day." Lennon admitted it was "a tough situation" for himself as a manager. "Don't get me wrong, you never like to see trouble coming to your door and I want my players to go out there fully focused on their job," he added. "However, all that has happened has not really hampered Paul."